TG4 will tonight air a programme on the extraordinary life of Vere Goold. 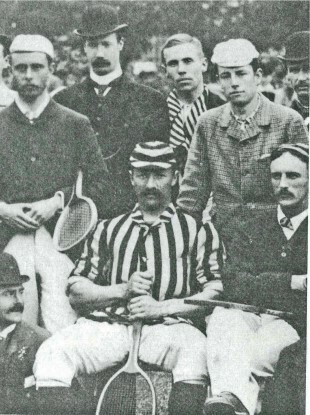 Waterford-born Vere Goold was one match away from becoming the third ever Wimbledon champion when he lost out to John Hartley. Unfortunately, his remarkable life took a turn for the worse in 1908 when he was convicted of murder in Monte Carlo and shipped to Devil’s Island, where he committed suicide a year later. TG4 docudrama ‘Dhá Chúirt’ will be broadcast tomorrow night (9.55pm) and tells Goold’s incredible story. Vere Goold is one of the most interesting characters of Irish sporting history and his life is full of dramatic ups and downs which went from a pampered youth to his ultimate demise on Devils island,” said the programme’s producer Shane Tobin. @His name still lives on in infamy in Wimbledon as the only finalist to be convicted of murder at a time when the game of tennis was at its peak in Ireland and we did justice to that amazing story with our great crew who worked on it”. Email “Documentary: The Irish Wimbledon finalist who was convicted of murder”. Feedback on “Documentary: The Irish Wimbledon finalist who was convicted of murder”.